When I first cracked open the pages I wondered, how will I navigate such a comprehensive text. Lucky for me Jen already thought this through and starts the book with a section devoted to navigation of the text. I immediately went from slightly overwhelmed to overly excited and knew I had a gem in my hands. The book is broken into thirteen goals and from there Jen explains why the goal is important and how to know if it is the right goal at the right time. From there she shows the list of skills and strategies that build to each particular goal. Did I mention there are 300 strategies? Then we get to the good part, Jen has brilliantly organized each page for a busy teacher. Not only does she include a description of the strategy, she gives lesson language, prompts, teaching tips and an image to illustrate each. In the margins she has listed the reading level that the strategy is appropriate for, the genre/text type, the skill involved and then a “hat tip” to reference the author and book that inspired the strategy. I felt like I was crawling around in Jen’s head while I read the book absorbing all her knowledge, expertise and learning from many years of hard work. Below is a peek at how the book is organized with call-out balloons explaining each portion of the strategy page. These are guided tour images and are from uncorrected proofs retrieved prior to publication and final editing. Take into consideration the images may change slightly in the final copy. Now, let’s get some answers to some of your burning questions before you dive in to this text. Jen elaborates on a few ideas from the book and gives us a peek at what to expect. What inspired you to write this comprehensive book? In short, teachers kept asking for it! I received countless emails daily, and it seemed like during every workshop someone would raise a hand and ask, “Where could I get a book of the strategies?” I found that I was referring people to a variety of places for different types of strategies. I wanted to make one book, for K-8, to show how reading development and the strategies you’d teach to support it, looks across all of those levels. Why didn’t you include standards? As this book goes to print, the Common Core is less “common” than it was even a few years ago, so that’s part of it. But it’s also because I believe in these very important principles of good teaching: We must meet children where they are, we must understand them well to teach them, and we must offer them the right amounts of supports and challenges to grow. That’s what this book is about: targeting the just-right teaching at the just-right time for each learner. This book helps you to identify goals for children and gives you the how-to to move them forward. I wanted to support teachers to start from an assessment of what a child can already do, to pick one of the thirteen goals, and to start teaching. When teaching matches a child, and is clear and explicit to support their independent practice, it will inevitably also help the child reach higher standards. You devote a whole chapter to writing about reading. Why is this so important and what can writing teachers take away from this book? Reading and writing are inextricably linked (there’s another book in that! I think maybe Lester Laminack and Reba Wadsworth may have just written it!). I believe all the teaching a teacher does in reading has a twin on the writing side. For example, when we teach children to infer about characters in the books they read based on character actions and dialogue, we can teach them in writing to show not tell their character’s traits, to leave the same clues for their readers as the authors of their books have done for them. We can teach children when reading to think about plot structure as a predictable organizer that helps them to retell the most important events from the books, and in writing we can teach them to use plot structure to plan and organize the story they plan to write. So one answer to your question is that writing teachers are reading teachers, too, so I hope that writing teachers take away helpful ways of viewing stories and informational text, and reading behaviors and habits that can inform their writing classroom, too. I also think that writing about reading can be its own goal, and I included a chapter on this because I believe that writing can be an important tool for recording thinking in the moment, and for elaborating on thinking to outgrow original ideas. The writing about reading ideas I’ve included in this book are not leading children to create “polished” pieces (literary essays, book reviews, etc.) but rather short-jot and notebook work. I guess this can mirror the writing process, too: the idea of keeping a collection of ideas you’re still noodling around with before writing a more formal “finished” piece. You say you want teachers to grow out of this book. What can a seasoned teacher take away when reading? Yes. 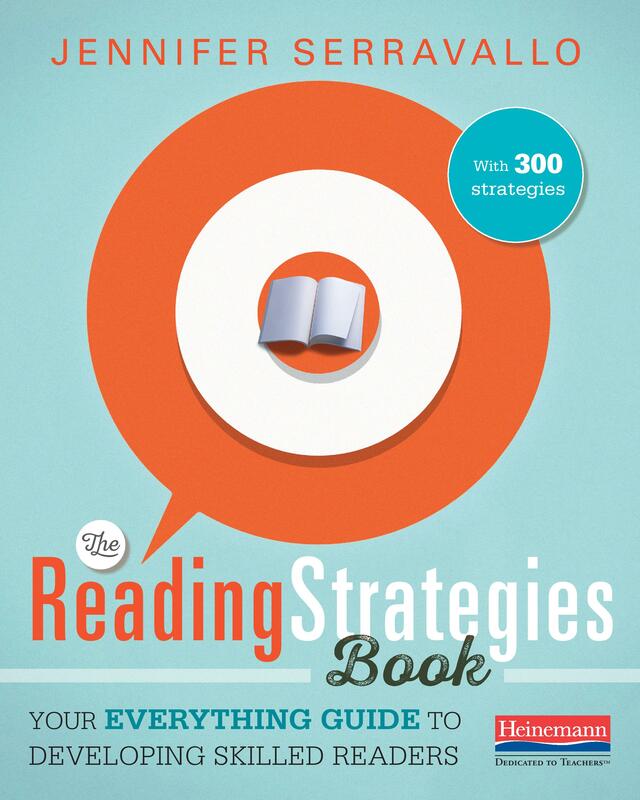 I want teachers to use the 300 examples of strategies, 300 examples of visuals, thousands of examples of prompts and more to eventually feel, “I get how a strategy and prompt sounds. I can make up some of my own.” I hope that teachers still return to this massive resource like you would a favorite cookbook, but that they also feel empowered to innovate and make things their own. In the year or so I was working on this book, I sent many drafts to experienced teachers and literacy coaches all over the country to try these lessons out and give me feedback. 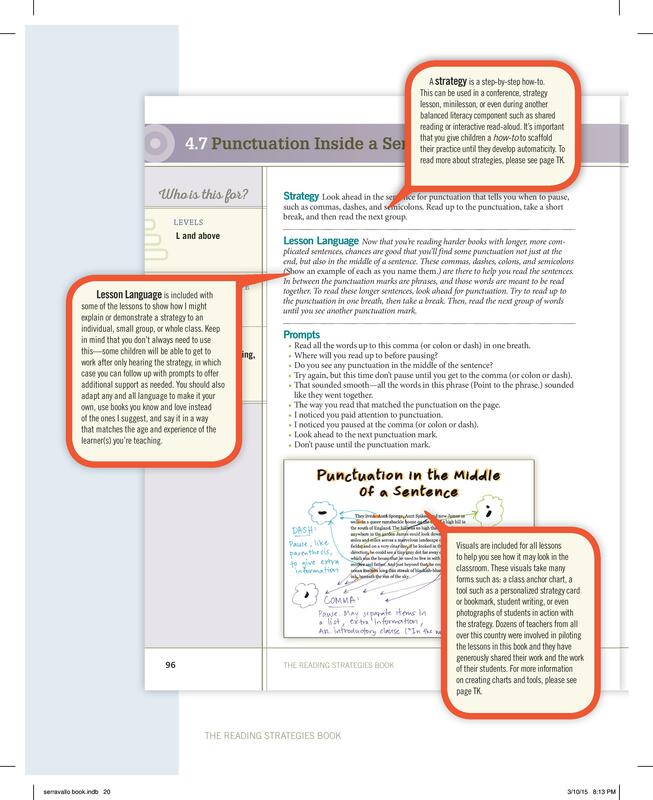 Even those with lots of experience remarked that they got a lot of new ideas, so I hope that I’ve been able to accomplish making the text supportive enough for first year teachers, and packed with enough new thinking that even experienced teachers and literacy coaches will find lots of useful stuff! Buzz About Books (chapter two) Learn ways to recommend books to peers by writing/telling about important elements like plot, theme, characters and topics. Unpacking What It Means to “Sound Right” (chapter three) Connect skills in writing, the jobs that words do, to the words students are reading. 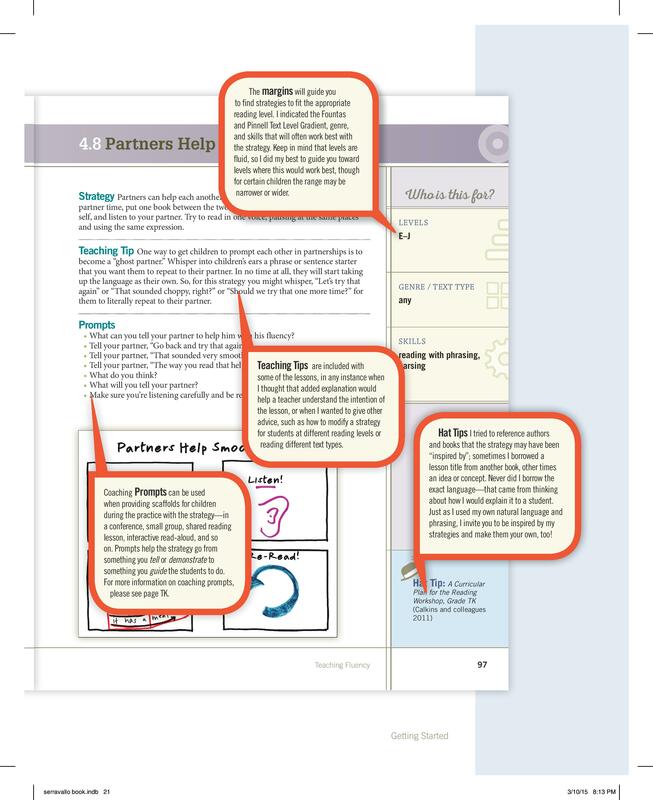 Angled Summaries for Highlighting Deeper Ideas in a Plot (chapter five) Students learn to stop and say/write what the story is really all about and support statements with details retelling specific ideas in the story. Look for a Pattern (chapter six) Students learn to distinguish traits from feelings and begin to notice that traits are revealed through a series or pattern of behaviors. Students can record these patterns to clarify their thinking or take these ideas to their book club to discuss further. The Difference Between Plot and Theme (chapter seven) Creating a t-chart or diagram, students can record the evidence from the text that helps distinguish between these two terms. By starting with the plot, what happened, students can then go to the other side of the chart and write the big idea surrounding that plot line. Most Important…to Whom? (chapter eight) When you and the author or a peer may not agree, organize your thinking by stating what you feel is most important and supporting it with details from the text. Sketch a Memory (chapter thirteen) Determining how reading has been a positive experience in a student’s life. My Reading Timeline (chapter thirteen) Students record a timeline of events in their reading life, (ie, Age One, Brown Bear Brown Bear is my favorite book. Age Three, I read Hope on Pop all by myself. Age Five, I read a story to my class). Lifting a Line (chapter thirteen) Students record their reactions and thoughts to a powerful line in a text, of their choosing. This is a mere sample of strategies from the 300 that make up this comprehensive text. The best way I can prepare you for this book is to get sticky notes and highlighters ready, because you will need them to mark up your favorite thoughts and ideas. I hope you found this informative and maybe get started with a strategy I listed or better yet, pre-order the book and wait patiently. The book will be released in mid-June when I will do a second post with a possible giveaway, so stay tuned! But wait! Do you want a sneak peek? Here is a video put out by Heinemann Publishing that gives a snapshot! My “To Read” pile just got a little bigger! As a literacy coach, this sounds like a wonderful resource to have to support the teachers I work with. This looks like a great one to add to my summer list. Thanks for the post and especially for the sneak peak at specific ideas in the book. I love this post Betsy! I am so excited about this book. Thanks for such a comprehensive review. Sounds like a must-have. Thanks for sharing Betsy. I preordered it at yesterday’s meeting. I think this will be a great resource for RTI. This makes me want to join a book group reading the book. Oh yeah, I no longer have a classroom, but I do have my after school book club group of students to influence and nudge! This sounds like an anchor text for any teacher involved in teaching reading and writing to K-8 students. I plan to read it even though I am no longer actively teaching (retired :). Any author who chooses to transcend the Common Core mania to write about “real teaching,” is a hero in my opinion. I love that she feels reading and writing instruction are inextricably linked to nurturing budding readers and writers. I’m SO excited to get my hands on this book. We have the entire summer to digest and dissect it. Wouldn’t it be great if We could have a Twitter chat with Jennifer Serravallo would be available to all of us, so we could ask her questions? Thank you!!!! What great timing! I just received an email from Heinemann yesterday about Jen’s book. Being that it was Jen’s book, I knew it would be good, but I have a stack of PD books still waiting to be read, so I tried to ignore this one. You have made that impossible! 🙂 Thanks so much for a great post and a great preview. At least now I know I will be getting my money’s worth! I first fell in love with Jen’s thinking and writing with her book Teaching Reading in Small Groups and have been a fan ever since. I learn so much from her. Can’t wait to hear your additional thoughts in your second post in June. You’ve convinced me! Looks like I have my summer professional read planned! I preordered mine a month ago as I believe this is a game changer! I am encouraging all my teachers to buy it and am reserving funds from next year’s budget for copies. Definitely adding this to my “must have” list- thanks for the complete review! Oh my goodness, I WANT this book!! It looks like an amazing text…so practical and informative! The only complaint I have…mid-JUNE?!?! We have to wait til June? I guess it will make good summer reading! 🙂 Thank you for the interview and review! I know, but you’re right, great summer reading so you can digest it a little before diving in when Fall hits!